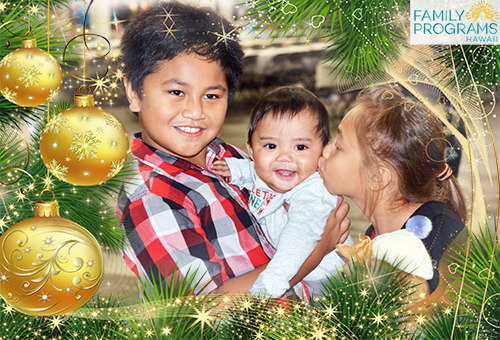 For the last 18 years, members of the community and Family Programs Hawaii have been throwing the Annual Holiday Party for keiki in foster care. Family Programs Hawaii wants to ensure that children and youth in the foster care system get to experience a joyous holiday and create happy memories during a time that is usually very difficult because they are separated from their families. Family Programs Hawaii works with the Department of Human Services to gather children and their foster and adoptive families for this once a year event where siblings are reunited, a holiday meal is shared, activities and fun is had, an individualized gift is given to every child, and family portraits are taken with Santa to create lasting memories all year long. To help children and youth in foster care have a happy holiday this year, please volunteer, donate, and/or sponsor this magical event. If you would like to participate in the toy drive to collect toys for gifts to foster children, please email linda[at]familyprogramshawaii.org. If you would like more information about the event or volunteering year round, please email info[at]familyprogramshawaii.org.